From 3 November to 11 February, the indoor karting track has been reinstalled in Monaco in the Parking des Pecheurs. Clivio Piccione is managing the circuit once again, located, Bond-villain style beneath the Rocher of Monaco. 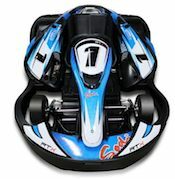 17 Sodikart electric vehicles are available, five of which are designed for children aged 7 to 14 and measuring at least 1.25 m. The remaining 12 karts are for adults and older children who are 1.5 m high. Session prices start from 20 euros for an 8 minute individual session, which includes the use of a helmet. Women are advised to wear flat heels. For more information and reservations, phone +33 6 59 55 25 79, email kartindoormonaco[at]gmail.com, and visit the venue facebook page at: Kart Indoor Monaco.